PLA 7 Plank Open Wagon 3 pack. BP 7 Plank Open Wagon 3 pack. Warwell Southern Railway - Revised Bed MS14176. Warwell with Steam Road Engine DM721211. Warwell A British Steel Corp. DM748305 Diamond Bogies. Warwell A Diamond Bogies BR Brown DM360331. Toad Brake Van - GWR 6 Wheel Planked (Early) Swindon. 7 Plank Mineral Wagon Rickett 3 Disc Wheels. 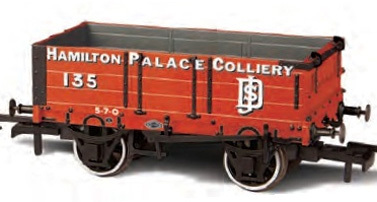 3 pack BSC 7 plank open mineral wagon. Cattle Wagon Lime Washed LNER 196152. 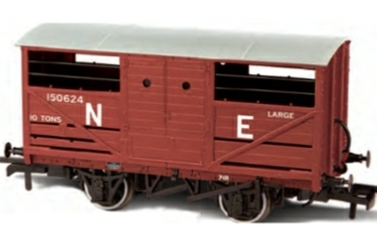 Cattle Wagon - LNER E156266. 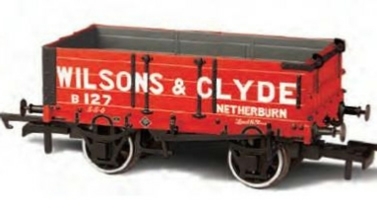 Cattle Wagon, LNER (NE) Livery.